Following is an edited version of National Council on U.S.-Arab Relations Founding President & CEO Dr. John Duke Anthony’s remarks to the Saudi Press Agency on April 22, 2015, about the latest developments regarding Yemen. Q: How do you assess the decision to end Operation Decisive Storm? A: What drove the decision was the achievement of the campaign’s objective. A: It was multifold. For example, it was not just to ensure that the chaos in Yemen would not spread to Saudi Arabia. To that end, it was to guarantee that the kingdom’s national sovereignty, political independence, and territorial integrity would remain assured and intact. It was also to ensure that Yemen’s rebels and all other armed groups in Yemen would not have the means to threaten the kingdom militarily. Q: How was this accomplished? A: It was achieved by the kingdom’s air force taking out Yemen’s missiles by disabling its ballistic missile defense structures and systems as well as by dismantling most if not all of Yemen’s main ammunitions depots, ordinance warehouses, and weapons-firing capabilities. 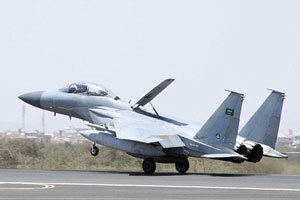 It was also achieved by gaining and maintaining effective control of Yemen’s air space; by administering an effective blockade of the major ports: namely, Aden and Hodeida if not also Mukalla; and by protecting its borders from Houthi rebel incursions. Only by first accomplishing these goals could the kingdom’s armed forces begin to launch its second campaign: namely, Operation Restoring Hope. Q: What are the defining features of Operation Restoring Hope? A: They are threefold: political, economic, and humanitarian. Q: How likely is it that these goals can be achieved? A: In the immediate term, the long answer is the same as the short one – unlikely. A: It has to do with the nature of Yemen’s economy, resources, and overall situation from the perspective of the people’s material well-being. A: I mean that Yemen is one of the Arab world’s poorest countries in terms of its gross national product as well as the income of its people per capita. I mean that it would be impossible to find another Arab country that is as massively and pervasively poor. Anyone who has lived and worked in the country and come to know its people, as I have been privileged to do, will acknowledge that the Yemeni people are among the world’s hardest working and at the same time the most in need of immediate and sustained economic and humanitarian support. 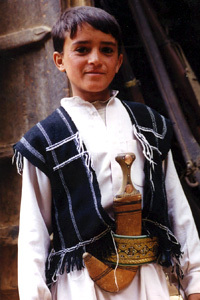 A Yemeni leader of tomorrow in Thula. Photo: Dr. John Duke Anthony. Indeed, few if any would deny that Yemen is in dire need of economic, material, and human resource assistance across the board in practically every sector associated with the country’s quest not just for sustained modernization and development, but also humanitarian aid in terms of food, safety, and shelter – right now and for the foreseeable future. In this regard, the Gulf Cooperation Council countries – Bahrain, Kuwait, Oman, Qatar, Saudi Arabia, and the United Arab Emirates – have not been found wanting. To the contrary, both individually and collectively, they have been and remain second to none in having extended whatever assistance they could – and can – in support of the legitimate needs, concerns, and interests of the Yemeni people. In this, Saudi Arabia has been in the lead, having provided over the past several decades more economic and developmental assistance to Yemen than all the rest of the countries and the world’s international financial and economic development organizations combined. Q: But what has been the result? A: The answer is far more and far less than one might imagine. Before and since the rebel uprisings occasioned by the Arab Spring in 2011 and the earlier and ongoing rebellion by the Shia Houthi tribes in the region north of the Yemeni capital of Sana’a – indeed, in an area that lies adjacent to the Saudi Arabian border – the degree and nature of support by the central government has been less than the people of this area believe would have been and should have been their rightful share. But in this self-centric view, they were not fundamentally different from innumerable other groups in Yemen that also felt deprived of what they have argued ought to be their due. Yemen’s Human Development Index (HDI) indicators for 2013 relative to selected countries and groups. Source: United Nations Development Programme, Human Development Report 2014, “Yemen Country Notes,” http://hdr.undp.org/sites/all/themes/hdr_theme/country-notes/YEM.pdf. Q: Is this all there is to the situation? A: No. What many overlook is that the humanitarian goals in Yemen cannot be accomplished without the achievement, first, of security and stability. Humanitarian administration, operations, distribution, and logistics will not be successful unless these two goals can be achieved. The adage of “Capital is a coward” – it is reluctant to go where security and stability is absent – applies in this instance. The economic factors necessary for the success of Operation Restoring Hope can be divided into two parts. The first and easier part is financing this effort towards which the “Friends of Yemen” countries have pledged billions of dollars with very little additional effort being required to secure the funds necessary. The second part, which is the harder part, is to ensure that the economic aid is distributed efficiently and effectively to the official and known parties in Yemen who would in turn use this assistance to help the population and the country recover from the current dire situation. Great care must be taken to prevent the economic aid from reaching unofficial or hostile parties who would use it to further destabilize Yemen, and threaten its neighbors, or use it for personal benefit. 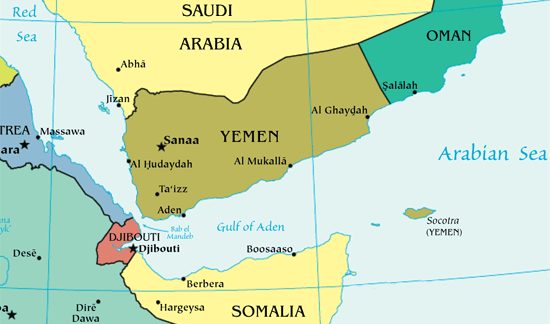 It is also important to remember that the Yemeni crisis is a direct result of the political positions, policies, and attitudes of the different parties in Yemen. The ensuing political chaos is the largest contributive factor to the current crisis in Yemen. A political solution in Yemen based on political conviction, commitment, and courage by all parties must be reached. Otherwise, Operation Restoring Hope will not achieve its desired goals. This entry was posted in John Duke Anthony, Saudi Arabia, Yemen.